Solar energy is one of the most versatile renewable energy sources. It is considered to have the greatest potential of acting as a substitute for the traditional thermal or coal-fired energy. Nevertheless, the preference of solar energy over the conventional energy sources is not only a function of the drive towards green energy & sustainability but also gets influenced by solar energy cost. Next sets of questions that arise are what determines solar energy cost and how the trend in solar energy cost has shaped over the last few years. Solar energy cost can be directly connotated with the tariff quoted by solar developers or the fixed cost of installation incurred by the residential or commercial consumers who plan to amortize the cost through savings in the utility bill over long-term (10-15 years normally). Solar energy cost to some extent depends on the nature of solar energy system viz. rooftop or ground-mounted large-scale solar parks. In the case of solar parks, since loads for various consumers are aggregated, the solar developers are able to achieve economies of scale. This brings down the solar tariff quoted by the developers. Other determinants of solar electricity costs are whether the solar energy system is on-grid or off-grid with battery storage, what is the location of the project, what are the existing state policies at the project location and what are the prevailing market conditions. When we break down the cost of different components for a simple rooftop PV system, PV modules alone constitute 52% of the total cost, followed by inverters at 23% cost and balance of systems (cables, etc.) at 17% cost. Installation costs around 8% for a typical rooftop PV plant. A normal 1 KWp plant without any storage facility costs around INR 1 lakh. The cost of a 100 KWp plant installed by a solar developer, however, can go down to 65-70 lakhs. 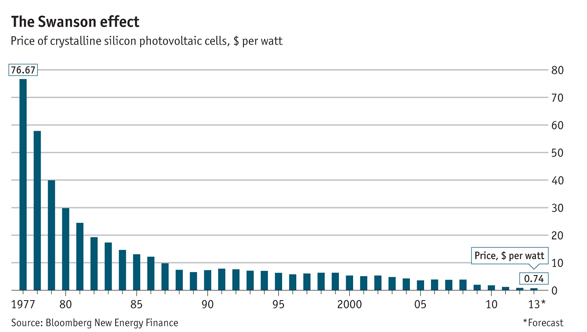 The solar energy cost has drastically reduced over last few years. This can be attributed mostly to the increasing solar cells efficiency and falling panel prices. The first useful silicon solar panel, invented by Bell Labs in 1954 was about 6 percent efficient. The evolution of solar technology has been at a landmark pace since then. Nowadays panels as efficient as 30% are being manufactured, which can produce 25% more electricity than the lower-tier economy panels in the erstwhile market. In 1977, solar panel cost was $77 per watt. In just 40 years’ time, it has reduced by 99.2%. With the advent of newer technology in installation, the execution cost of solar plants has also come down over years. The movement towards the greener and sustainable energy in the wake of global warming is prompting nations to come up with policies in favor of solar energy. The utility scale solar farms facilitated by Governments for supplying solar energy using state transmission are further bringing down the costs. In a nutshell, solar energy is becoming cheaper and affordable and has already achieved parity with the grid tariff in most states, increasing the odds of adoption by all set of consumers.